-->If you are still spending a lot of time manually recording serial number on your copied media…. -->If you have no idea of what yield rate of your duplication task…. Able to record 300,000 operation (around a year) without connecting PC, which saves a lot of time from type-in log report manually. Hand writing wastes time easily make mistakes, even typing into PC gets more chance to make error. Log Report handles everything together in one time. (4) Quickly find out Flash with the same S/N. 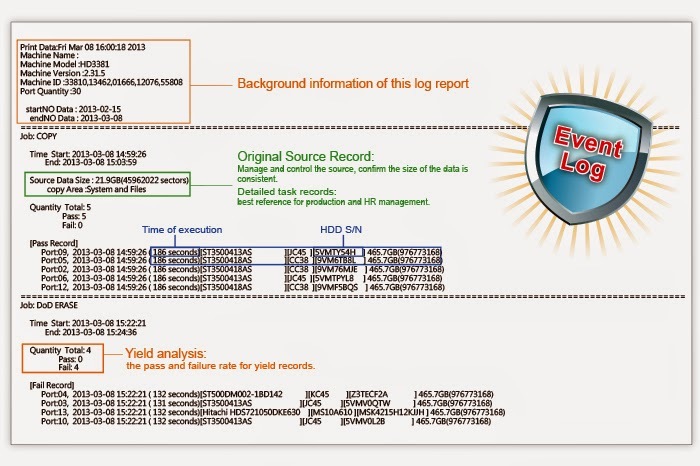 Viewing log report via Microsoft Excel, same S/N will be sorted out instantly. No need to look at S/N one by one. 1. whether client use un-related Flash as defective product or not. No confusion caused while daisy-chained multiple duplicators.E.g., while export log report from 10 duplicators, report will classified by duplicator ID.